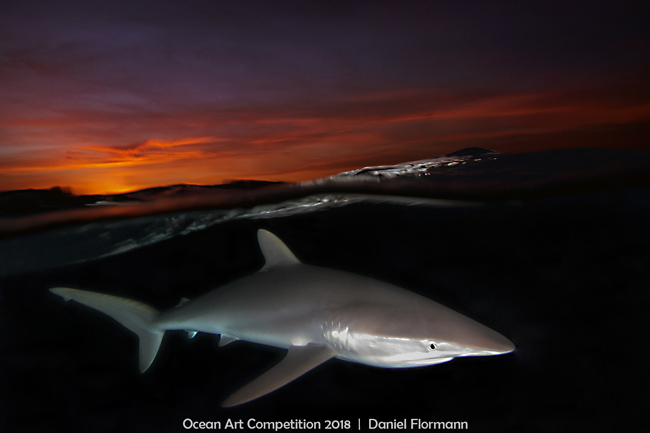 The Story: In order to get a sunset shot with the silky sharks around we skipped our afternoon dive to an early evening dive. The silky sharks came close, but the waves -as visible on the picture- were simply a nightmare for a split shot. Anyway, the time frame for the picture was very sharp, because of limited sunset time with a proper ambient light. So, it took rather long to get a suitable situation with a shark in a more or less suitable distance and position. Finally, it was indeed the last shot of the day which reached the composition as planned. The funniest part while taken the picture was a baby caribbean reef shark that was super interested in our diving and camera gear. In detail it basically touched us everywhere and came often so close to the camera that many pictures turned out to show out-of-focus parts of this lovely guy (he came way too close), but not at all the planned image. In order to get the proper ambient light in combination with a handy shark to lens distance range the picture was on purpose slightly overexposed, which was reduced in the image workout process. Classically, backscatters were removed as well. Equipment Used: Canon EOS 7D Camera, Ikelite Housing, Canon 10-22mm Lens, Dual Ikelite-DS-161 Strobes.